Jason is in his fourth year as head coach of the Bruins after spending 12 years as the jv coach. In the 15 years that Jason has been a part of the Bruin bench, South has finished as State runner-up 4 different times, EDC champions 5 times, and East Region Champions 7 times. Prior to coming to South, Jason spent seven years coaching in the boys and girls programs at Aberdeen Central, a Class "AA" school in South Dakota. He was the JV girls' coach and the sophomore boys' coach. 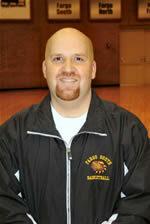 Jason was named Region 1 Boys Assistant "Coach of the Year" in 1998. He also coached for one year at Edmunds Central High School in South Dakota and one year at Wolford High School in North Dakota. Jason graduated from Jamestown High School in 1985 where he played basketball for the Blue Jays - they finished 2nd to Fargo North in the State tournament that year. He is currently the math department chair at South High, graduated from NDSU in 1990 with a BS degree in Math Education and has a Masters degree in Education from St. Kate's in Minneapolis. Cammi is in the role of JV coach for her fourth season on the Fargo South sideline. Cammi was a 3 year starter for the Bruins from 2004 to 2006, played in 2 state title games during her time as point guard, and was named All-EDC for 2 years. She played college basketball at both Concordia College and Jamestown College. Cammi is one of four former Bruins to become an assistant coach for South High joining former sophomore coaches Tonah (Paulson) Safranski and Jessica (Trautwein) Myxter and freshmen coach Katie Thorson. She graduated from Jamestown College with an elementary education degree in 2011 and is substitute teaching for the Fargo Public Schools. Cammi also coached middle school volleyball at Carl Ben. Andrea begins her third season on the Bruin staff in the role of sophomore team coach. Andrea was a varsity basketball player for West Fargo High School and played college basketball for Valley City State University. Andrea has been teaching science at South High for the past 4 years. 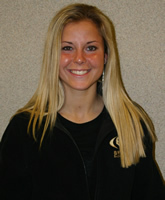 Andrea also is the head volleyball coach at Fargo South. Katie starts her second season with the Bruins, going from leading on the court as an All-Conference player in 2007 to leading from the sideline as the Bruins freshmen coach. Katie was a part of the 2006 team that played for the state championship, and as a senior, her 2007 team won the East Region tournament. Katie had previously been a volunteer coach in the Bruin Youth Basketball program for 2 years. She is a graduate of Minnesota State University Moorhead with a degree in elementary education.